(Phys.org)—A team of researchers affiliated with several institutions in Japan, examining data from that country's moon-orbiting Kaguya spacecraft, has found evidence of oxygen from Earth's atmosphere making its way to the surface of the moon for a few days every month. In their paper published in the journal Nature Astronomy, the researchers describe what data from the spacecraft revealed. Scientists have known for some time that the moon is constantly bombarded with particles from the solar wind and have also known that once a month, as the Earth is positioned between the sun and moon, the moon is protected from the solar wind. In this new effort, the researchers describe evidence of oxygen ion transport from Earth's outer atmosphere to the lunar surface during this short periodic time period. Prior research has shown that oxygen atoms become ionized in Earth's upper atmosphere when they are struck by ultraviolet light. Sometimes, this causes them to speed up to the point that they break away from the atmosphere and move into what is known as the magnetosphere, a cocoon that surrounds our planet that is stretched like a flag away from the direction of the sun due to the solar wind—so far, in fact, that it covers the moon for five days each lunar cycle, causing the moon to be bombarded with a variety of ions. Data from Kaguya now suggests that some of those ions are oxygen. The researchers found that approximately 26,000 oxygen ions per second hit every square centimeter of the moon's surface during the deluge. 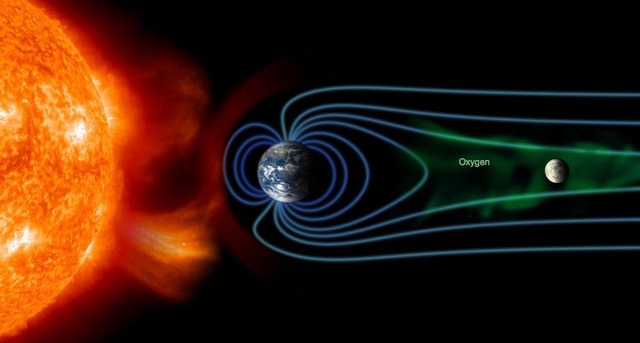 For five days of each lunar orbit, the Moon is shielded from solar wind bombardment by the Earth's magnetosphere, which is filled with terrestrial ions. Although the possibility of the presence of terrestrial nitrogen and noble gases in lunar soil has been discussed based on their isotopic composition, complicated oxygen isotope fractionation in lunar metal 2,3 (particularly the provenance of a 16O-poor component) remains an enigma. Here, we report observations from the Japanese spacecraft Kaguya of significant numbers of 1–10 keV O+ ions, seen only when the Moon was in the Earth's plasma sheet. Considering the penetration depth into metal of O+ ions with such energy, and the 16O-poor mass-independent fractionation of the Earth's upper atmosphere, we conclude that biogenic terrestrial oxygen has been transported to the Moon by the Earth wind (at least 2.6 × 104 ions cm−2 s−1) and implanted into the surface of the lunar regolith, at around tens of nanometres in depth. We suggest the possibility that the Earth's atmosphere of billions of years ago may be preserved on the present-day lunar surface. Nobody has demonstrated a ball with water on the surface and an atmosphere spinning and flying through a vacuum. Ya know - the people on the ISS whizzing around the globe every 90 minutes or so would disagree. But you're probably going to tell us that the ISS (which you can see with the naked eye, BTW) is fictional, too, right? There is no outer space. Earth is flat and motionless. Scientific fact is when you can demonstrate it witnessed by more than one person. Nobody has demonstrated a ball with water on the surface and an atmosphere spinning and flying through a vacuum. That is a physical impossibility. Water lays flat always finds its level. That is a scientific fact. You have been fooled with CGI, photoshop, animation, special effects trickery and double talk jive jibber jabber occult falsehood fraud. Are you on Trump's science advisory team? If not, put in an application. Maybe this is a bad dream, you need to wake up Neo! Ya know, considering that this is a pretty obvious troll, all you've done is feed it. Hey jonesdumb, wouldnt you looky there. More electric discharge. Hmm... thanks for confirming that there's empty space between your ears. Considering the slew of anti-science, climate deniers, electric universe nuts, generally incoherent guys, chemtrail conspiracy theorists, and more on here....there's really nothing so absurd on an english speaking comment section that it would count as 'obviously trolling' anymore. The crazies have long ago managed to out-troll the trolls by going even lower. Earth is flat and motionless. Flat?OK.... But motionless? Nope. The four elephants supporting the earth are standing on the back of A'tuin the Great Turtle, which has been proven to be swimming through the cosmos. Where have you been? Hiding in a cave?